The Lions' Share: Look at the IMMS Library Orientation for Teachers & Survey results! 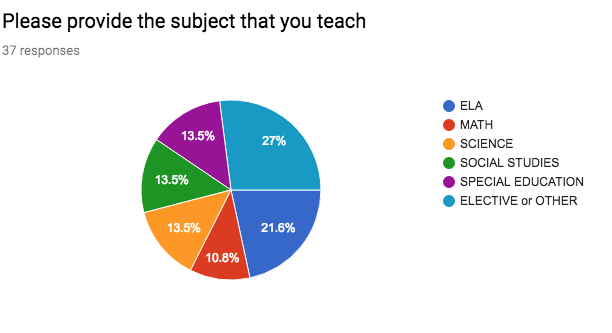 Look at the IMMS Library Orientation for Teachers & Survey results! Our new principal, Ms. Mareka Austin, afforded me the great opportunity to introduce myself and our little library to all the faculty during three, forty minute rotations in the library. I crammed a lot into this precious time: showed an AdobeSpark presentation of last year's library events (above), discussed how to develop a reading culture in their classrooms and our school, and demonstrated how to build their own "Collections" in Destiny, our library automation system. Afterwards teachers mingled in the library, grabbing a cup of coffee and a biscotti, if they wished. As part of the presentation, I requested that they fill out a survey, which is linked in the Adobe presentation. 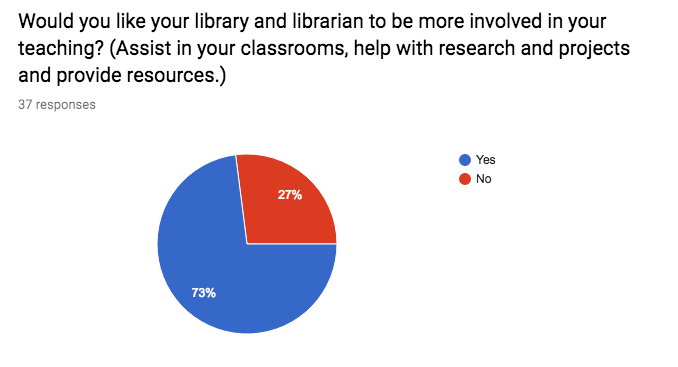 The verbal comments in addition to many of those in the survey indicate the need and desire for a strong library program and for a full-time librarian willing to partner with teachers in teaching and providing resources for our students. One new teacher came up to me afterwards and said that she "didn't know" that libraries and librarians "could be like this" because in her past experience, they had not been. Another teacher (non-ELA) indicated in her survey, " I appreciate you. Thank you for offering so many things. You will get sick of my face this year. I want to work in LOTS of reading." Many asked for resources in the subject they are teaching or for book trailers, research help, plagiarism lessons, DEAR time, author Skypes and virtual reality experiences. Teachers want STEM/STEAM programs, Book Clubs, Book Fairs, Writing clubs, Author visits - the list goes on. 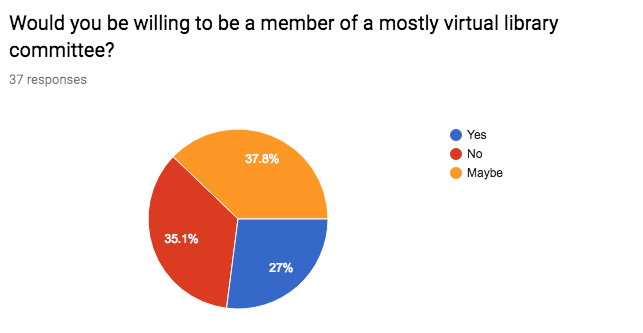 The next chart indicates the number of teachers who are willing to volunteer to be in a committee for the library! They want to do fun things for our students like STEM clubs and Book clubs. The last chart is especially important, because it indicates that 73 percent want their librarian more involved in student learning, forming a partnership with the librarian for the benefit of their kids. Interacting with the teachers and sharing what we could do together was a very positive experience. I'm grateful that I had the opportunity to share what I can do with them as their teacher-librarian. I look forward to a great year. We can do much together.